on the 2014 'Come Home to Lakewood' House and Garden Tour. On September 7 from 1-6 p.m., community-nominated homes and businesses open their doors to the public for an afternoon that showcases outstanding examples of the city's unique architecture. From turn-of-the-century Victorians, classic Colonials, mindfully-restored Tudors to stylish mid-century modern condominiums, the tour offers something for everyone interested in discovering the places that provide Lakewood with its character and charm. Begin your House Tour weekend at the Patron Party Saturday, September 6, 6-9:00 p.m. 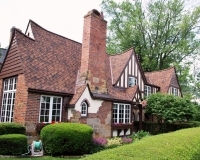 The Patron Party house, not on Sunday’s tour, is a lakefront with unique Tudor ornamentation inside and out. Enjoy food, beverage, entertainment, and the opportunity to bid on a wide variety of silent auction items and enter the Instant Wine Cellar raffle. The highly popular "Come Home to Lakewood" biannual tour traditionally sells out. Advance sale tickets for the House Tour are $25.00 and are now on sale. Tickets can be purchased at the Oldest Stone House in person or by mail, online at lakewoodmuesumstore.com or at the retail outlets listed below. A limited number of tickets may be available the day of the tour at the Nicholson House for $30.00. Patron Party tickets are $75 and include a ticket for Sunday’s tour. They can be purchased online, by mail, or at the Oldest Stone House during business hours. For more information, call the Oldest Stone House at 216.221.7343. Get your tickets before they’re gone—you don’t want to miss this event!